“The Double” has its Madison premiere on Friday, July 11 at 7 p.m. at Union South Marquee Theatre, 1308 W. Dayton St. as part of the UW-Cinematheque summer series. R, 1:33, three stars out of four. FREE! Richard Ayoade’s “The Double” has basically the same plot as Denis Villeneuve’s “Enemy,” in which a nebbishy nobody finds he has a an exact twin, a cockier and more successful version of himself. Somebody needs to flip the script and make a movie about an arrogant stud who comes across his own nerdy doppelganger. But, to quote the old song, it ain’t what you do, it’s the way that you do it. While Villeneuve’s’ film exuded a Cronenbergian sense of bizarre dread, Ayoade’s film is like slapstick Kafka, trapping its protoganist in a dystopian world so bleak and oppressive that it’s funny. 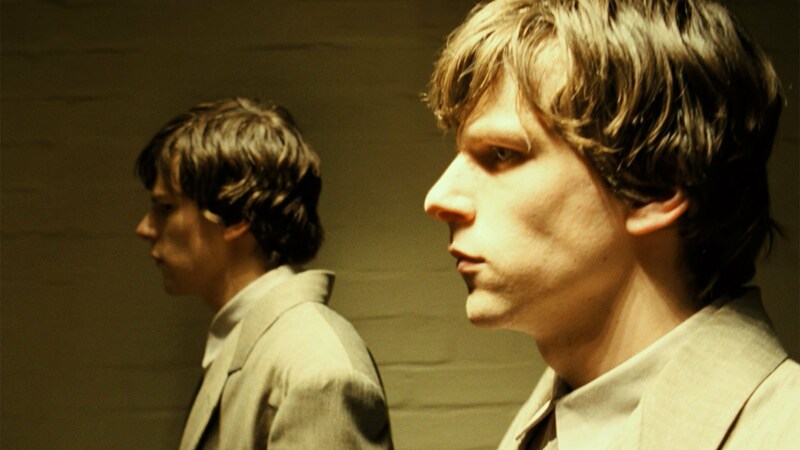 Jesse Eisenberg plays Simon James, a bundle of nervous twitches in an ill-fitting suit. He trudges to work at a mysterious data processing facility, trapped in a tiny, dirty cubicle with an oversized, bleating machine. His bosses disrespect him, his colleagues ignore him, his swipe card never works at the front desk. The only ray of sunshine in his life comes at night, where he looks through the telescope across his apartment courtyard at a co-worker, Hannah (Mia Wasikowska). It’s not much of an existence, but Simon is in jeopardy of losing even that when his exact twin, James Simon (also Eisenberg) shows up for work. Cocky, manipulative and sociopathic, James cuts a confident swath through the world, leaving admirers in his wake. Simon is baffled, in the way of all outsiders who wonder “What’s that guy got that I haven’t got?” The galling thing, of course, is that James Simon has precisely everything that Simon James has, and yet he’s everything Simon yearns to be. Simon’s struggle to reclaim his identity against this other self (which is really his id gone wild) makes up the emotional heart of this movie, and Eisenberg gives a master class in playing the tentative Simon off against the wolfish James– this may seem strange to say, but Eisenberg has great chemistry with himself. Subtle shifts in posture and expression effectively clue the viewer in to who’s who — it gets to the point where we can tell which Eisenberg we’re seeing before he even opens his mouth. 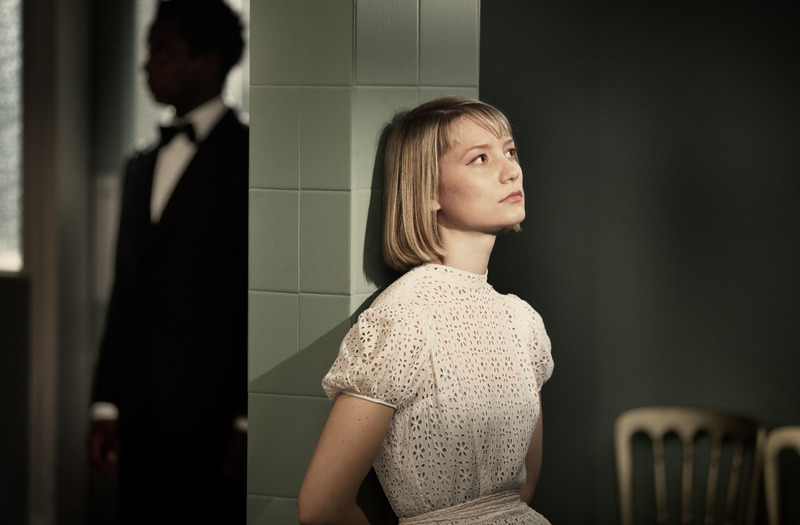 But the real star of “The Double” is Ayoade, who between this and his dazzling coming-of-age debut “Submarine” is quickly establishing himself as a director worth watching. The set design of the film may seem bleak, all smudged ochre and cold grays, but Ayoade lays a staggered, playful comic rhythm over top. There are moments in here worthy of Buster Keaton, as when Simon is in a Polynesian restaurant trying to eavesdrop on a conversation between Hannah and James, and a waiter comes over and turns on blender after blender around him. Like Keaton and other silent comedians, Simon seems to be surrounded by a world stacked against him, a world that then smiles and bends out of the way when James walks by. His struggle to reclaim his identity (or at least deprive James of his) makes for a strange and invigorating film.